We all love PB&J sandwiches. An easy lunch that combines sweet jelly with savory peanut butter for a complicated taste. Here are some PB&J ideas reserved for the courageous only. This idea is not so adventurous, but it is oh so good. Grill the sandwich! Even just toasting the bread heats the PB&J to make a nice texture and delicious taste. You can take advantage of the two tastes of the PB&J and go either way with it. Some savory recipes include spicing it up. Try adding jalapeño peppers, bacon, and cherry jam. For breakfast, put bacon, maple syrup, blueberry jam, and peanut butter between two slices of french toast. Get really crazy by putting an egg on top. Is your mouth watering yet? Give your PB&J a southeast Asian touch with coconut shrimp, sriracha, curry, basil, and orange marmalade. Experiment with recipes switching out peanut butter for almond, hazelnut, or walnut butter. Now for some ideas from the sweet side. 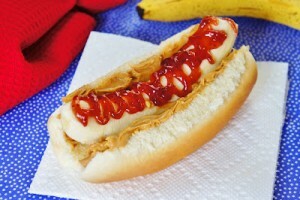 Add cream cheese, bananas, and strawberry jam to your peanut butter. For a sweet breakfast favorite, combine peanut butter with granola, bananas, honey, and apple butter on cinnamon raisin bread. Try fresh pomegranates, or replace the jelly with Nutella and add bacon. Make a PB&J S'more by adding chocolate and melted marshmallow. The right bread makes all the difference in your peanut butter and jelly. For bread baked with grains freshly milled each day, come by The Great Harvest Bread Company in Spokane. Visit our website to find out all about our baked goods. Give us a call at (509) 535-1146 to find out about our daily baking schedule so you don't miss out on our next batch.